Ronnie O’Sullivan’s hot streak continued as he thrashed Graeme Dott 4-0 to reach the last 32 of the ManBetX Welsh Open in Cardiff. O’Sullivan’s World Grand Prix triumph last Sunday was his fourth ranking title of the season, and one more would match the record of five held by Stephen Hendry, Ding Junhui and Mark Selby. Today’s match – a repeat of the 2004 World Championship final – could have had a different outcome as Dott had chances in every frame, but the Scot failed to capitalise and O’Sullivan ran out an easy winner with top breaks of 106 (his 60th century of the season) and 69. He now meets David Grace. 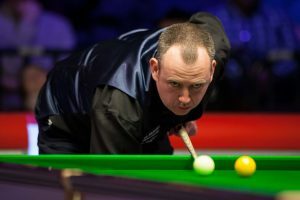 Home favourite Mark Williams kept up his hopes of winning a third ranking title of the season as he beat India’s Aditya Mehta 4-3. Williams led 2-0 with breaks of 79 and 106 before losing a marathon 76-minute third frame. The black became trapped behind a cluster of reds over one corner pocket and a long safety tussle ensued, finally resolved when Williams accidentally knocked the black in. Mehta then took a 3-2 lead before Williams won the last two frames with 89 and 75. Neil Robertson joined Judd Trump and Ding Junhui as the big-name casualties on day three, despite making three centuries. After five frames Robertson led 3-2 and had a 100% pot success rate having fired runs of 100, 100 and 130. But world number 100 Burns, who earlier had breaks of 85 and 106, took the last two frames with 75 and 47. World number one Mark Selby was also knocked out, losing 4-3 to Liang Wenbo in a match which finished at 1.10am. Defending champion Stuart Bingham ended the hopes of Welsh 16-year-old Jackson Page, winning 4-2 with top breaks of 77, 92 and 65. Kyren Wilson showed his break building skills in a 4-0 win over Rory McLeod, rattling in 100, 85 and 136, while John Higgins also top scored with 136 as he won a tartan tussle against Stephen Maguire 4-1. Masters champion Mark Allen made a 116 in a 4-1 win over Soheil Vahedi while Ben Woollaston edged out Anthony McGill 4-3 despite being hauled back from 3-0 to 3-3. The last 32 and last 16 will be played on Thursday, click here for the match schedule.